Baby shower pictures from the shower the wonderful folks at work threw for us. Baby pictures by the dozen. Blog about Isabella and my new life as a parent. I have a handful of hobbies, some of which I actually find some time to do. We now own Precision Martial arts. Paintings and drawings I have done. I mostly work in egg tempera now, because I love the colors. I actually make my own paints from pigments, egg yolk, and vineger. Sewing is a great way to make clothes that don't fall apart instantaneously, and it's also handy for making stuffed animals and such. Pictures from our sort-of annual pumpkin-carving party. 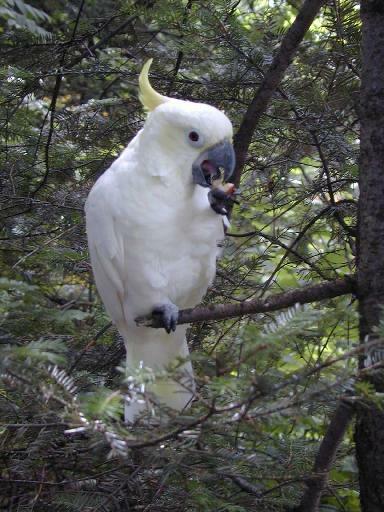 I once had a cockatoo, Tia, who pretty much ruled the household. She's over thirty now, on a semi-permanant vacation, and, and yes, she does speak, although nobody understands what she's saying except me.